Cointreau is a brand of triple sec liqueur, and is produced in Saint-Barthélemy-d'Anjou, a suburb of Angers, France. Cointreau sources its bitter oranges from all over the world, usually Spain, Brazil and Saint-Raphaël, Haiti. 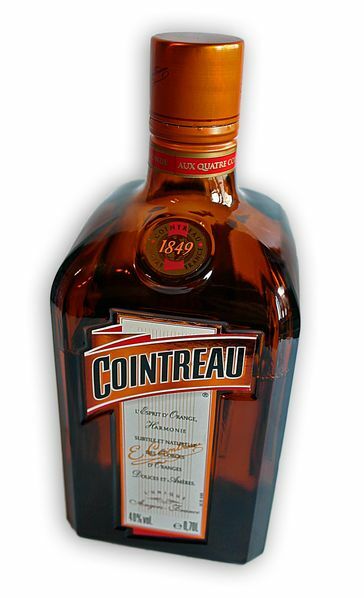 In addition to being imbibed as an apéritif, Cointreau is sometimes used as a digestif. Cointreau is considered to be either a premium brand triple sec or a unique category of liqueur. With a 40% alcohol content, Cointreau is strong for a triple sec which usually have an alcohol content between 15 and 40 percent. Left: A bottle of Cointreau. Cointreau Distillery was set up in 1849 by Adolphe Cointreau, a confectioner, and his brother Edouard-Jean Cointreau from Angers. Their first success was with the cherry liqueur, guignolet, but it was when they concocted a blend of sweet and bitter orange peels and pure alcohol from sugar beets that the success of the enterprise was definitively confirmed. In 1875, the first bottles of Cointreau were sold. It is now estimated that thirteen million bottles are sold each year, in more than 150 countries. Ninety-five percent of production is exported. In addition to being consumed neat (or often on ice), Cointreau is used in cocktails including the Sangria, Margarita, Cosmopolitan, White Lady and Sidecar.